While a Doctor Strange sequel is inevitable, it probably won't be announced until after the movie comes out this November. On top of that, Doctor Strange 2 won't even hit theaters until the next decade, coming as part of Marvel Phase 4, which kicks off in 2020. Thankfully, fans of the character won't have to wait that long to see Benedict Cumberbatch's return as the Sorcerer Supreme. The actor has confirmed that he will return in Avengers: Infinity War, which hits theaters summer 2018. Most guessed this was happening, as it has long been teased that Infinity War will contain upward of 67 Marvel characters. It makes sense that Benedict Cumberbatch's Doctor Strange would be one of them. And from the sounds of it, this fall's standalone adventure helps set up the events in Avengers 3. Captain America: Civil War, which arrived in theaters this summer and is now available on Blu-ray and VOD, was Marvel's most ambitious movie to date. It featured 12 superheroes going to battle over the Sokovia Accords. And it's a fight that will continue on in Infinity War, which will make Captain America 3 look like a minor skirmish. The next adventure for the Avengers is bringing everyone out of the woodwork, including the Guardians of the Galaxy, Thor and Hulk. We may even see some of the TV characters joining the fight, such as Daredevil, Luke Cage, Jessica Jones and the Agents of S.H.I.E.L.D. It will be the largest cast ever assembled for a Marvel movie. Heck, it might just be the biggest ensemble cast ever gathered for any movie. And without a doubt, we're even going to see some new faces, such as Captain Marvel and new villain Death. As expected, Doctor Strange will not be sitting quietly on the sidelines. Speaking to Empire, Benedict Cumberbatch hinted that he will be on his way to Atlanta at the end of this year to start filming his role for Infinity War, with production scheduled to begin in November. Though, he will not be needed for the entirety of the shoot. And there has been the logistical challenge of aligning his schedule with those of Robert Downey Jr, Chris Hemsworth, Elizabeth Olsen and Paul Bettany. But it is going to happen, none the less. He says this. "To get us all together will be quite something. That's why this character is being introduced, to open up the next chapter... So watch this space to see how that unfolds." 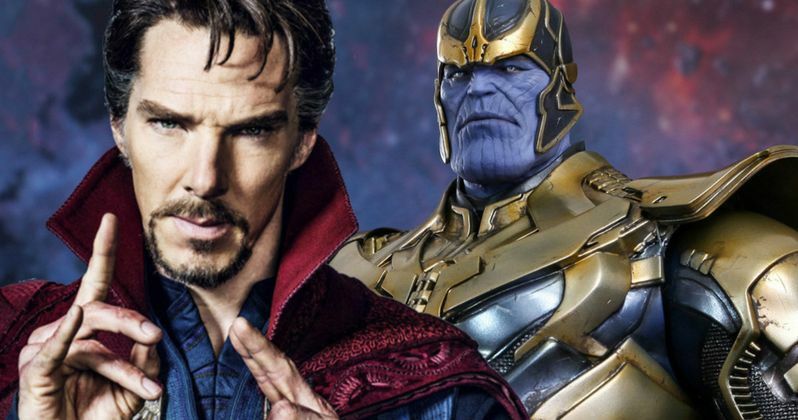 Not only will Doctor Strange show up in Avengers: Infinity War, Benedict Cumberbatch is expected to return in Avengers 4, which still doesn't have a proper title. It isn't known if there are any Marvel cameos in Doctor Strange, though Tony Stark is rumored to be making an appearance. As it were, many are speculating that Infinity War will properly introduce the Sorcerer Supreme to the larger MCU. And it's possible that he could join the ranks of the Avengers. It has also been hinted recently that Doctor Strange will have a quick cameo in Thor: Ragnarok, with Chris Hemsworth spotted on set holding a business card with Stephen Strange's address on it. It has long been believed that Doctor Strange's Eye of Agomotto is actually the Time Stone, and that will bring both Thor and Thanos into contact with the character as they hurry to find the final two Infinity Stones. However this all shakes out, and whether or not the box office warrants a Doctor Strange sequel, we'll certainly be seeing more of the character very soon and before the end of the decade.